I spent the weekend with my best gals at a scrapbook retreat and I was able to make lots of cards. This is one of my favorites. You have seen that border die and flower die before (from MFT Stamps) and the focal image oval and mat (from Spellbinders) but now I want to show you something I haven't shown you before. What am I talking about you ask? I want to show you an image made with a digital die cut machine - specifically, the Slice Elite this time. That vintage silhouette was made using the Think Pink cartridge. I love my metal dies (no secret here), but sometimes it's fun to break out some technology and use it. One thing I love about digital die cut machines is that you can have a large size range for your images. This little image is 2" tall, but it could have been much smaller or larger. And I think that is pretty handy. Now that I've been using it some, it really makes me want to look at their new cartridges....so off to shop now. The silhouette is beautiful. 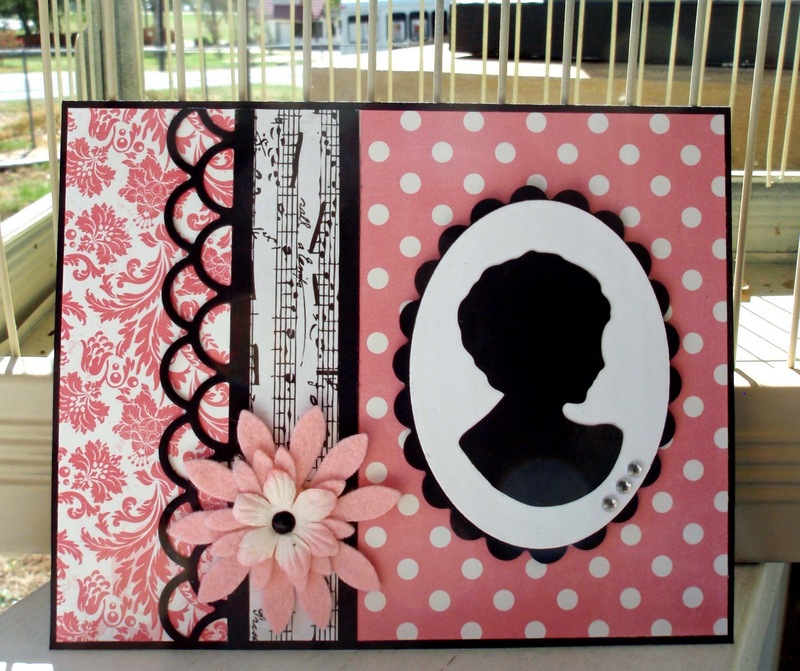 Love the pink papers you used and the black makes everything feel elegant. So glad you shared your work with us at Hand Stamped Sentiments! Perfect card! The silhouette is very striking with that patterned paper and love your touch of bling. Thanks for playing with us this week at Hand Stamped Sentiments. You have been selected as a Hand Stamped Sentiments Artist Pick for your design this week! You have earned the HSS Artist Pick Badge to display on your blog. Please email me to obtain the html code for your badge. Cute and elegant at the same time! 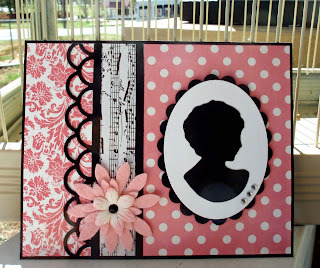 I love the black with the pink and white and I love all the vintage looking patterns you used on this card! Thanks for playing at Hand Stamped Sentiments!